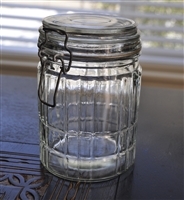 Clear glass stripes embossed lidded jar. 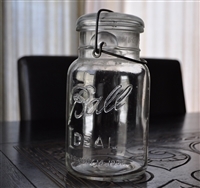 Bell's twisted lid dimond pattern medium size jar. Vintage Weisley China exotic pitcher, water ewer. Santa Claus 1993 See's Candy tin Christmas tree ornament. Chesebrough vaseline jar with lid. VIntage glass from 1920s. Vintage glass Tang jar embossed with boy fishing scenery, SUMMER, L in a circle mark. Cobalt blue stoneware cheese jar with wire closure. Ball Ideal glass jar with wire closure, 1930s. Vintage clear glass small apothecary bottle with stopper. Hull USA vintage Kitten planter in pink porcelain. Cobalt Blue glass Italian storage container with lid. Currier & Ives gifts from Arby's 1981 collectible glass Winter Pastime and Danish Butter Cookies round tin. 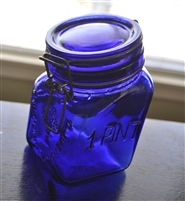 Granny's Products Cobalt Blue Italian jar, 1 Pint. Apothecary milk glass with blue transferware decor made in Belgium. Houston Harvest milk glass jar from Hallmark. Granny's Products Cobalt Blue Italian jar, 1 Quart. Vintage cobalt blue caged design salt and pepper shakers. Vintage Japanese ceramic round two handed bowl for serving or storage. Vintage Tins set of two with log cabin New Hampshire Absolute Pure Maple Syrup and English lidded nautical theme tin with seashells. Brockway Machine Bottle Co lidded Jar with Bear and Peanuts The Old Fart's Nuts writing. Vintage Fenton green glass Rose design footed bowl. Duraglas Half Pint Mayflower Milk bottle, 1958. 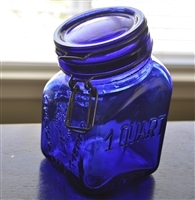 Granny's Products Cobalt Blue Italian jar, 1-1/2 Quart. Avon Cape Cod ruby red vintage set of two glasses and two salt and pepper shakers. Indiana glass diamond point milk glass and hobnail milk glass ivy bowl. Fenton crimped milk glass vase, top hot and footed small dish. FIDENZA Italian square Jar with Cobalt Blue Lid and wire closure made in Italy, 4-3/4" tall. Windmill colorful DELFT DIP lidded trinket storage box sign 34 SME DIP Delft. Smith Glass Co 317 pattern milk glass serving bowl in arch and stars design.